It may be less than a year since Narva introduced its new Ultima 215 L.E.D driving lamps in Australia, but they’ve already been widely adopted by a great many off road enthusiasts and commercial vehicle owners, and have drawn huge praise from industry experts. An important feature of the Ultima 215 is that it meets the stringent requirements of CISPR 25 which is part of the ECE Regulation 10 for EMC, a feature that is sadly not evident ain many other lamps on the market Narva Marketing Manager, Jake Smith, said the company knew the lights would be popular but had not fully anticipated the spectacular market uptake. “Throughout the lamps development we were extremely excited about the lights’ performance and the potential impact they would have on the market,” Jake said. “The 215 L.E.D lamps provide the latest technology, outstanding light output and the reliability and toughness Narva lights are known for and these qualities, coupled with a reasonable price point has struck accord with customers. The strength of our research, development and testing meant that the lamp was compliant with CISPR 25 on release, further broadening the appeal of the lamps, especially for emergency services applications where the avoidance of radio interference is critical,” Jake added. Former 500cc GP champion turned outback adventure tour operator, Daryl Beattie, has fitted two pairs of Ultima 215s to his IVECO 4x4 support truck, which regularly criss-crosses the Simpson, Canning Stock Route and through to Cape York. Daryl has been thoroughly impressed by the lamps. Similar praise for the Ultima 215s has also been drawn from four wheel drive expert, Simon Christie, who hosts leading television off-road adventure programs, ‘4wdTV’, ‘Your 4x4’ and ‘Life Off Road’. “You haven’t experienced ‘engineered’ L.E.D until you’ve driven behind these,” Simon said. The Narva Ultima 215s are also being widely used by commercial vehicle operators, including professional truck driver and road safety campaigner, Rod Hannifey. Rod has four Ultima 215s mounted to his Kenworth and regularly uses them, particularly on his interstate routes from Dubbo to Brisbane, Melbourne and beyond. The Ultima 215 L.E.Ds feature a class-leading hybrid beam pattern that combines volume for off-road use and long range performance for on highway transport applications. Each light is equipped with 33 x 5W (165W) XP-G2 Cree L.E.Ds that develop a pure white output (5700°K) and a penetrating light of 10,500 raw Lumens. As a pair, the lamps provide an impressive 1 Lux of brightness at 900 metres. As well as using powerful Cree L.E.Ds, the performance is aided by the lights’ highly polished, aluminium, metallised reflectors which feature precisely scalloped parabolas for superior control and performance. The lamps feature die cast aluminium housing, ‘Active Thermal Management System’ allowing the lights to run harder for longer, while also incorporating a nitro breather vent and integrated DT connector, and are fully sealed against water and dust ingress to IP66 and IP67. Other benefits of the lamps include an L.E.D front position light to improve daytime driving visibility, virtually unbreakable polycarbonate lens and see-through lens protector. Also included in each kit are four interchangeable coloured trim pieces (blue, black, yellow and red), allowing buyers to customise their light appearance. A stainless steel bezel comes standard with the lamps but for those wanting to further develop an individual look, Narva is offering two other bezel options (gloss black or chrome-plated) for a modest additional cost. The Ultima 215 L.E.Ds allow for a straight forward installation process. The lights introduce a tough and versatile new mounting system incorporating a pressure die cast mounting bracket, three bolt mounting with stainless steel hardware and a polymer rubber mounting and suspension set-up for resistance to corrugations and bumps. 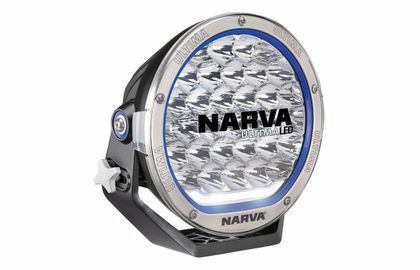 Given their power output, Narva recommends matching the lamps to a heavy duty wiring harness. Narva has developed its own harness (part no. 74403) specifically for the Ultima 215 L.E.Ds and for its high output L.E.D light bar products; it features a ‘plug and play’ design, 40A relay and fuse, and heavy duty cable to allow increased current draw for optimum performance. For peace of mind the Ultima 215 L.E.D lights are backed by a 5-year L.E.D warranty. Narva Ultima 215 Driving Lamps are available from leading automotive, 4WD and Transport outlets.